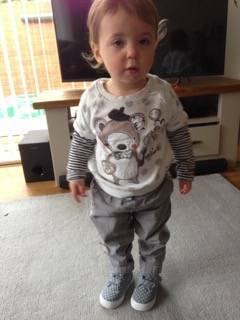 Holly has been walking now for four months and she has the cutest shoes that her grandparents brought her…but it was time for this little girl to have her first pair of trainers! 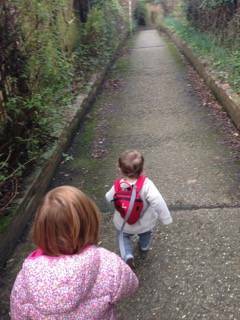 It was a cold, miserable Friday, we had dropped Alice off at preschool and we headed into town. The first shop we went in the trainers they had were not what I was looking for, they were more for playing sport in and we are not quite at that age yet!! So, it was onto the next shop. The two ladies in the shop were so lovely, chatting to Holly while I was looking at all the lovely trainers they had to offer us. The great thing at seventeen months old, I have full control over what Holly wears…I know this doesn’t last, so I am totally making the most of it! I had picked out a pair that were perfect for Holly and the lady went to fetch her size. When she brought the box out, Holly was so excited to try on her new trainers. She looked so little and cute sat on the stool, with the biggest grin on her face. She walked so proudly around the shop, checking them out in the mirror. She didn’t want to take them off…I am just pleased they fitted, otherwise it could have been a challenge to get her to give them back!! 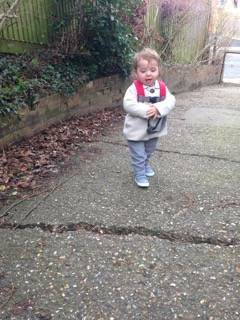 When we arrived back home, those trainers were still not coming off…’No, No mummy’ and off she ran. It was then time to go and collect Alice, getting ready was quicker than normal because Holly still had her trainers on! 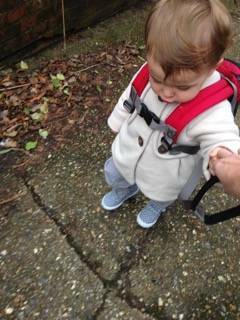 She loves the walk to Alice’s preschool, but today she had an even bigger smile on her face and kept looking down at her new trainers. On the walk home we normally talk about what Alice had been doing at preschool, but today it was all about the trainers! I love the way, Alice chats away to Holly…she doesn’t care that Holly can’t answer her (yet!). When we arrived home, I was waiting for Holly to start again with the ‘No, No’, when I tried to take off her new trainers. 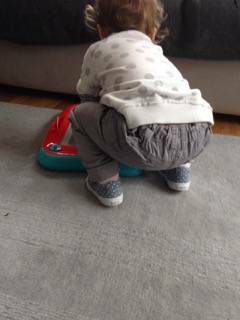 But I turned around to see her sat on the step, letting her big sister take them off for her…those girls melt my heart! Then off Holly trotted to proudly put them next to Alice’s trainers. Awww these are so cute! 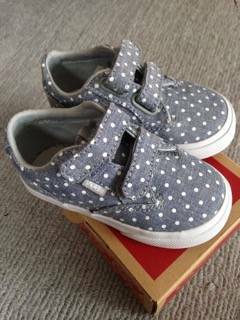 Such a big milestone getting your first pair of shoes. So cute! 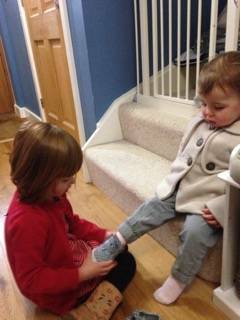 Love big sis putting little sis’ trainers on. My eldest is 5 and i still pretty much choose all his clothes! Doubt that’ll happen with girls though! Thank you 🙂 it’s was so adorable watching them. No, my eldest daughter does not let me dress her! !